After several decades of evolution from single career woman to wife and mother, I have become a morning person. I tend to “snap” awake in the mornings. Why? There is so much to complete before the kids and I can escape from the house. We follow a routine to get out the door and are mostly on time. A menu planner is affixed to the refrigerator and reminds us of what we will eat for the week. The night before, I choose a dress to wear. The next morning, I put it on and I’m done. Snap! Despite the quiet street, its better to stay away from the parked trucks on Pitt Street. This J.Crew dress is a lovely colour and silk is perfect for humid summer days. The necklace is also from J.Crew with a green frog set in pavé and pearl. So fun! My heels are from Easy Spirit but remind me of Chanel. Staying cool in the heat of the afternoon. I have also noticed a definitive “brain snap” when the terrain around me changes while on a bicycle. The most extreme snap occurs when encountering traffic after cycling on a quiet road or trail. For example, when the road is quiet with few cars and a hill to climb, I tend to focus on my breathing, position on the bicycle, and staying positive. How do my legs feel? Do I need water or can I continue on? Scenery, the scent of the air, the heat of the sun all become enjoyable. This depends on angle of ascent, of course. While descending a hill, the wind provides a reminder of having exerted myself and the need to apply my brakes gingerly to stay in control. Riding home from such a ride means using another set of skills altogether. I snap to attention when the numbers of cars far outweigh the number of trees. I believe the luxury of self-focus is finished when there are cars around. Fortunately, the bicycle and I know each other well and can accelerate and stop quickly. But mostly, riding in traffic is a triumvirate of being hyperaware of all visible cars, anticipating aberrant driver behaviour and cycling fast enough to keep up. 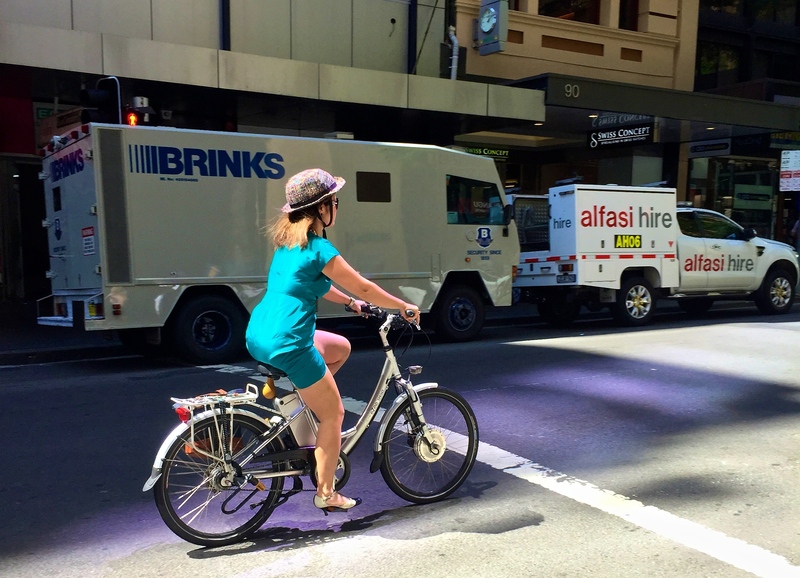 I have noticed another “snap” when transitioning between the cycleways and traffic. Unfortunately, the bicycle paths in Sydney do not connect. To get anywhere in the city, I must ride in traffic. For a short period of time on the College Street Cycleway, I feel relaxed and aware. The lost tourist is a manageable obstacle until I enter Macquarie Street, land of aggressive panel vans and unloading taxis. The people on the phone, who cross the Kent Street Cycleway without looking, are another matter. Fortunately, they are not as menacing as a car. When leaving the cycleways, I find that I snap to ready awareness in anticipation of the traffic. Ready awareness of the traffic on ever narrowing Pitt Street. My perspective on riding in traffic was heightened during my last (disastrous) mountain biking lesson. Before going over the handlebars to land on my helmet, shoulder, ribs, and then having the handlebar gouge my leg, my instructor said that he was nervous about riding in traffic. He said that he felt more comfortable riding in the bush because trees don’t leap out at you. Oddly, I feel the opposite. I feel more comfortable riding in traffic than I do on a mountain bike trail. I realise that perspective and practice are the point. When faced with a series of rocks or a step at the bottom of a narrow dirt packed hill, I tend to think, “I can’t. How can I possibly get through that?” Of course, I have had much more experience riding in traffic with daily drop-offs at childcare and school, going to work, shopping, out to dinner, riding home to meet the nanny in time. Snap! “For the things we have to learn before we can do them, we learn by doing them.” Aristotle, The Nicomachean Ethics. 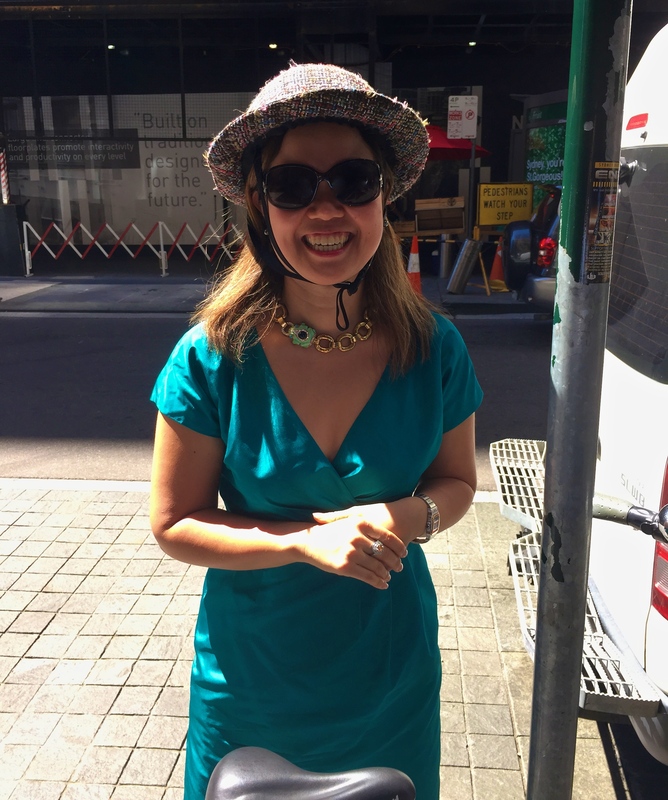 Today’s ensemble: J.Crew silk dress and necklace, Dior sunglasses, Yakkay helmet, Lovisa ring, Easy Spirit heels, Cartier Santos, eZee Sprint bicycle, Linus Eleanor handbag. PS. Another reason why I ride. There is no shortage of parking for my bicycle. Next postI Did Nothing to Lose Twenty Kilograms. April Fools! 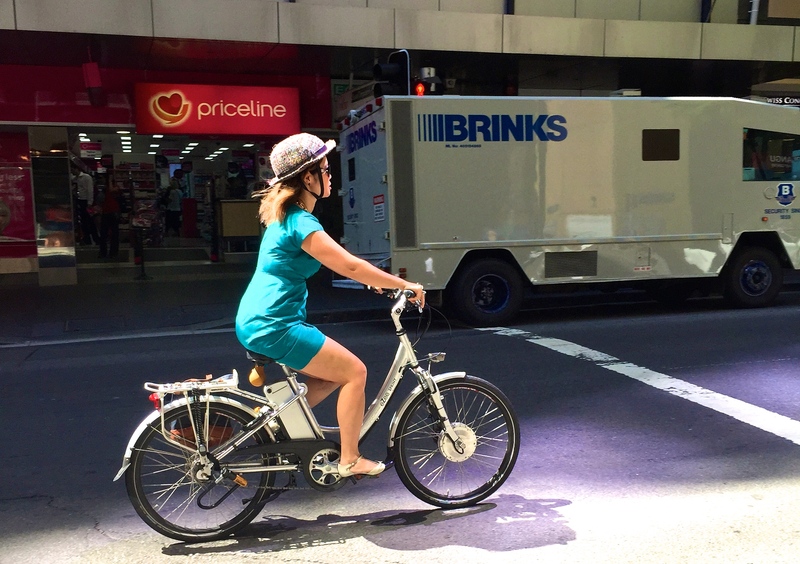 I ride an electric bike every day, also, a Woosh Santana, but not in a frock. The Ezee Sprint may well be my next bike, which is how I came upon this site.